Part 5 of this series sees me flying from Osaka's Kansai airport to Taipei. 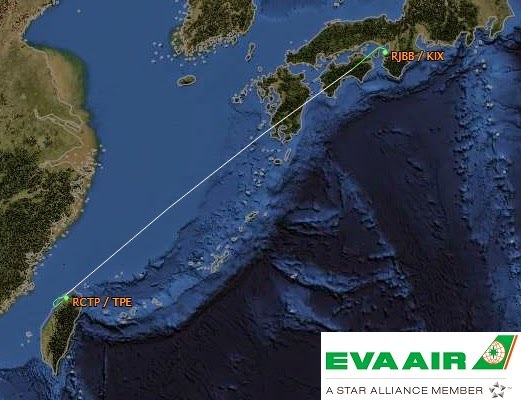 I was particularly excited as it would be a new carrier for me, the first time ever I have flown with EVA Air, one of the newest members of the Star Alliance. Not only that, but I was flying on the pride of the fleet, the Boeing 777-300ER with the Royal Laurel seating. Very exciting! After I booked this sector I decided to pre-order my meal for the flight, and I ordered the Din Tai Fung beef brisket noodles. This needs to be done at least 24 hours before departure. I also pre-selected a window seat, 2K. With my special services requested all that was left was to take the flight! To get to the airport from central Osaka I took the limousine bus, it's comfortable fast and efficient, and depending on where your hotel is it can be more convenient than the train. The lounge offerings from ANA are abysmal. Very little food and a fairly limited drink selection too. Overall very disappointing... it seems ANA and JAL both don't really care about their lounge offerings. There was also a very limited view so do not plan to stay in here for long, show up as late as possible! The aircraft registration was B-16709, it was 7 years old at the time of the flight. There is 38 Royal Laurel class (Business) seats, 63 Elite Class (Premium Economy, and 211 Economy, for a total of 312 seats. Boarding was slightly delayed as the aircraft had arrived late from it's previous flight. When it was eventually time to board I was personally greeted and shown to seat 2K.... and I was immediately impressed. The cabin is very attractive with sleek and clean lines and a very understated colour scheme. Overall a very pleasant place to be. The seats are in the reverse herringbone arrangement, probably the best seating configuration around as you face in towards the windows and you don't pay any attention to the passengers around you. They are very private and quite close to a first class experience. The seats to recline into a fully flat bed, although since this was a short flight I did not use it. I started off with a welcome orange juice and a wet refresher towel which comes in a package. A great and extensive selection of drinks were available, including the De Castelnau Blanc de Blanc 2002 champagne, which I rather enjoyed. There is AVOD available for all passengers, the system is called 'Star Gallery'. In business class the screen swivels out from the side wall of the suite. It's a decent size and provides a quality picture. There was a fairly extensive selection of entertainment, although not as much as that provided by Emirates or Singapore Airlines. The meal was good, although I was still hungry afterwards. There should be slightly more food I think, or maybe I'm just a greedy person? I asked for some ice cream off the western menu, but I was told they had none left! As we were nearing Taipei I ordered a cappuccino, it comes with a stick coated in sugar you can use as a stirrer, very clever. The Captain announced we would have a short hold due to heavy traffic coming into Taipei, I didn't mind too much, more time to enjoy the flight, although I did have a fairly tight connection of only 1 hour! The crew were extremely polite and friendly the whole time, the service was good although they could have offered a few more drink top-ups without being asked. At least they answer the call bell very quickly. I found the seat very comfortable in the 'lounging' position, which I used throughout the flight. There was no need for a flat bed on this short sector but it was great to have the option. I'm sure those on long haul connections would make use of it. We touched down at about 5.30pm, it was already almost dark and I was slightly concerned about my connection at 6.10pm. We ended up parking next to the Hello Kitty jet that would be taking me to Hong Kong. I gathered my cabin bag and headed for the door, I bid the crew farewell and power walked down the jetbridge to transit security and on to the gate for my next flight. As it turned out I need not have rushed since the Hong Kong flight was delayed anyway. My first experience on EVA Air was a good one, the seat was exceptional. The catering was good although I think a little bit more food would be nice. The cappuccino coffee was very nice and onboard service was above average. EVA is a great addition to the Star Alliance network. Next up in this series of reports you will get to experience an EVA Hello Kitty flight! Very similar seating to Cathay Pacific although with much cleaner and smoother lines. Love the Hello Kitty catalogue! Can't wait to read Taipei to Hong Kong! Agree, the seat is essentially the same as Cathay but I felt EVA had done it just a little bit better!